I don’t know what the comparable stats are for the election of John Kennedy, but I definitely remember the same sort of entrancement of, and enthusiasm by, the youth, and it seemed sort of similar: he’s this young cool guy, with a beautiful wife, and adorable kids, and we can finally get away from the old old out-of-touch guy and get somebody young and glamorous. John Kennedy was an excellent speaker too, and back then there was much less transparency in government, so people took him at his word. Kennedy had the Catholic thing going on (would he take secret orders from the Pope?!!!) similar to the Obama/Muslim rumors, but there is of course a huge difference, and that is that Kennedy was white. And racism is by no means dead. But I think it’s going to get a big kick in the pants now with these great role models in the White House. Yes, Kennedy has come up in this argument before, but I myself think Obama had more effect because of the current time and challenges he faced. Of course, I wasn’t born for decades after his presidency, so I obviously can’t make a comparison based on vibe alone. I think that one of the main reasons that Obama was able to win was that he was able to energize the voters. It was this energy that was brought about the record number of votes being cast. These new voters translated into wins that were not thought possible in 2000 and 2004. Of course, being a resident of Indiana which typically is ignored by both parties (heck, we normally don’t even get to participate in the primaries). The only time a presidential candidate stopped in Indiana was to raise campaign funds. Maybe that has clouded my perception but this energy certainly got me paying more attention to the process. Pacer’s got a good point. Obama’s candidacy is one that invokes almost irresistible comparisons with Reagan’s “Morning in America”, or, as above commenters have noted, the Kennedy family. It’s the draw of a youthful, future-oriented campaign that plays on optimistic sentiment, rather than wonky policy (although Obama’s basically a wonk), or the naked fearmongering and divisive rhetoric of the past eight years. The reason we aren’t seeing this increase is that B: turnout surged across the board, and mostly in Obama’s favor. That graph shows that Obama won men with the largest Democratic vote share since Carter ’76. He’s made gains everywhere. 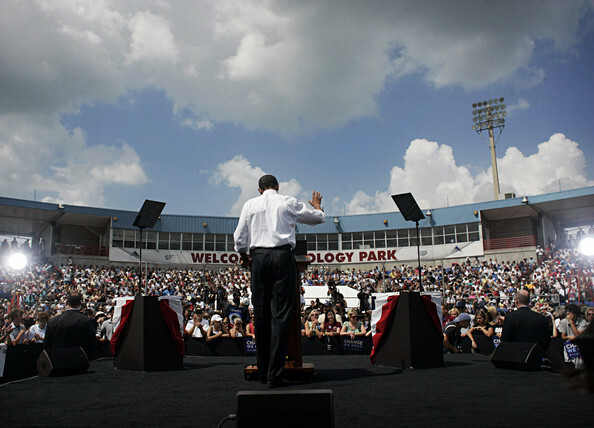 In short, while this is a youthful campaign, and one which naturally appeals to youth, Obama’s appeal was broad indeed. I think this bodes well, because the conclusion to the “youthquake” in the 1960s set in motion by Kennedy was a cultural backlash from older voters that we are just now getting over. If Obama can maintain his broad base of popularity, he may be in a position to be a truly transformational president, and the controversies about his race and cultural views that have dogged him may die a welcome death in his shadow. Yes, Indiana is in fact ignored by both candidates except when they need cash, but heck, so is california. The two campaign fundraisers I’ve been to here were purely to attract money. I agree about the energy. Although I won’t say that it was the entire reason bush won both terms, (it was more or less his brutal campaigning that won 2000) energy was no doubt there. And I think it is in this campaign, too, only I’ll still stick with what I said about the youth. They’ve really spurred Obama’s nationwide popularity, and I think that has gotten him of a lot of votes. Thanks for the comment. Thanks for the compliment and your comment. I was more or less referring to the youth noise that was created, not entirely the voter turnout. I was more or less pointing out the astonishing numbers of kids at put a political interest in a figure and somehow saw him as cool compared to everyone else. Thanks for the comment, I’ve got to get to school myself. Obama won not only because of his superb strategy, oration and youth factor but because people are tired of looking backwards, tired of their situation being hopeless, tired of a corrupt government, tired of being broke, and tired of not being able to look forward. Obama was able to symbolized all those emotions in one person and easily reached out and made people feel that they were alive and real again. The proof now will come in the actions! As noted by some of the other comments, the youth vote was not that big uptic that pushed Obama over the line. While the popular vote margin was large, when looked at state by state it was mostly in large states like Ny and California which made up 2.5 million votes alone. Looking at it in that light it is clear to see that it is and was a very complex victory. As a conservative as I analize the vote I am suprized at how many who called themselves conservatives voted for Obama. I heard one such voter ( who says he’s against what Obama wants to do )say that he voted for Obama because he didn’t want to spend his vote by voting for the less of two evils. He explained that nomater how hard he tried he could not vote for Mccain. Going against his conservative veiws he voted for Obama, hoping that in four years there would be a true conservative to vote for and that the country would be disaution with Obama. If you look at the vote totals of 63,,000,000 to 56,000,000 and take away the big blue state margins you will see it was a very close race and we are praticaly split down the middle. Add to that the fact that there were many on the dem side that would not be moved from their support of Obama. The associations and other problems that the media didn’t fully bring to light would not sway these people anway, because that had made up their mind to vote for Obama and they would not be swayed. I sincerely hope that the bitterness that has existed for the last eight years against George Bush from the left does not now shift against Obama just because we lost. The raw vote 65,340,608 to 57,358,053 total popular vote. In NY Obama got 1,787,026 more than Mccain and in California obama got 2,502,859 more. Mass. Obama got 780,000 more. Thats 4,289,885 of the difference in only three blue states. We can see then that it was very close. Time will tell. In the first few months as president, you’ll see how Obama will fare as president. Even though hes not president yet, it was sure nice to see adults in a press conference, unlike these past 8 years. You could tell the reporters were happy that they have an intellectual to ask questions to, not an ideologue.